The Microscopic Imager on the Spirit and Opportunity Rovers of the Mars Exploration Rovers is also known as MI. The high-resolution camera gives magnifying glass-views of Martian rocks and soils. It scouts promising targets for detailed study and analysis by other instruments on the rover. MAIN JOB:To provide extreme close-up black-and-white views of rocks and soils, providing context for the interpretation of data about minerals and elements. LOCATION:Mounted on the turret at the end of the robotic arm. SIZE:1.91 inches (48.6 millimeters high), 2 inches (51 millimeters) long and 1.61 inches (41 millimeters) wide. IMAGE RESOLUTION:31 microns per pixel (0.001 inch or 0.031 millimeter per pixel). Able to resolve 0.004-inch (0.1 millimeter) objects/features. 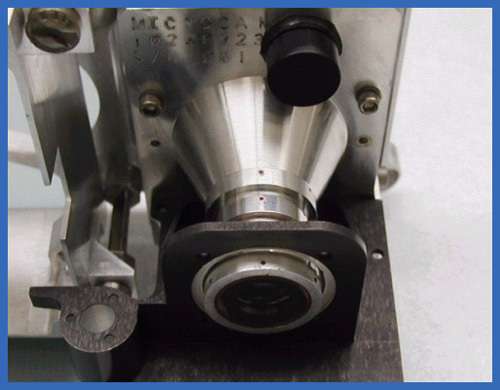 The Microscopic Imager is a combination of a microscope and a CCD camera that provides information on the small-scale features of martian rocks and soils. It complements the findings of other science instruments by producing close-up views of surface materials. 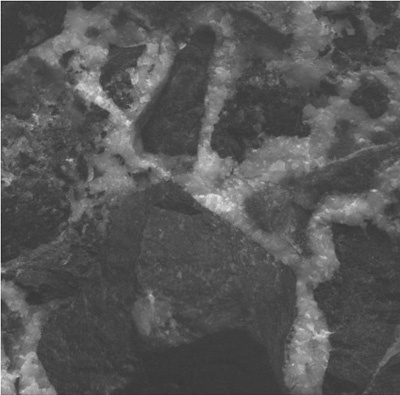 Some of those materials are in their natural state, while others may be views of fresh surfaces exposed by the Rock Abrasion Tool. Microscopic imaging is used to analyze the size and shape of grains in sedimentary rocks, which is important for identifying whether water may have existed in the planet's past. The Microscopic Imager is located on the arm of the rover. Its field of view is 1024 x 1024 pixels in size and it has a single, broad-band filter so imaging is in black and white.